I don’t need to tell you about Grand Electric. It opened in 2011, and since then, everyone in the GTA with even a vague interest in food has been there and has raved about the place. Everyone. I was afraid that it had been over-hyped to a level that no restaurant could reasonably reach. I was wrong. It is crazy delicious. The small, no-frills restaurant is laid out with the menu written on a blackboard on the back wall. And yes, as you have heard, it is very loud. They like their hip-hop here, and they like to crank it up. I could converse with my dining companion without having to raise my voice too much, so it wasn’t too bad (though I went for lunch and I suspect it gets louder in the evening). Did I mention that it was crazy delicious? Because it was. 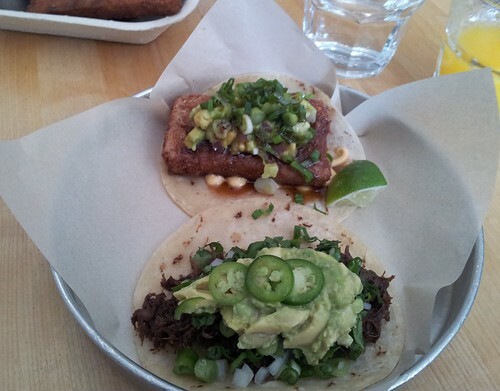 All three tacos were pretty great, though the highlight was the scrapple. Featuring a rectangular, crispy-on-the-outside-and-deliciously-porky-on-the-inside patty of pure deliciousness, which is topped with avocados and green onions and features a perfectly complimentary sweet sauce, it is one of the best things I’ve eaten in a while. If you told me this was all I could eat for the rest of my life, I’d be cool with that. The other two tacos were more traditional and were perfectly delicious, though they never quite reached the levels of transcendent awesomeness of the scrapple. 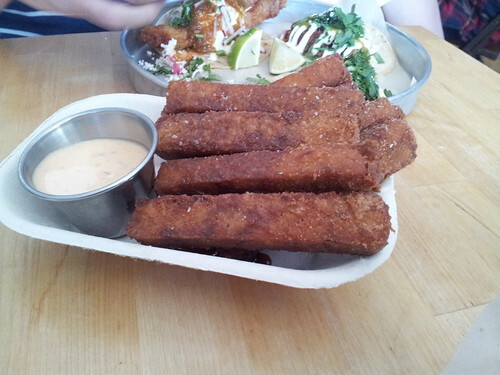 As for the Pig Head Fries, they were crispy and salty, with a creamy interior and a delicious dipping sauce that tasted vaguely like the Big Mac sauce from McDonald’s. They were quite tasty.